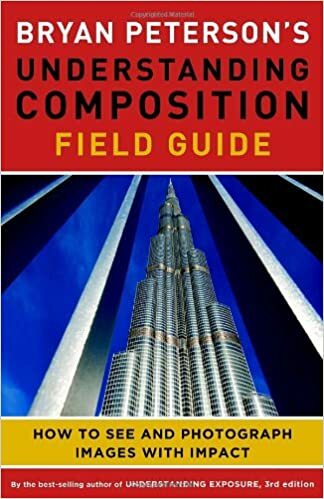 Many photographers on purchasing a new camera are preoccupied with learning its various features and controls and no doubt, this is important in obtaining correctly exposed images and an appropriate depth of field. However, once the basic operation of the camera is mastered, one needs to direct their attention to seeing and composing effective images. Effective images are those that command attention and communicate some feeling to an audience. Capturing a "feeling" and your viewers' attention is a demanding task that requires practice, experimentation and study. 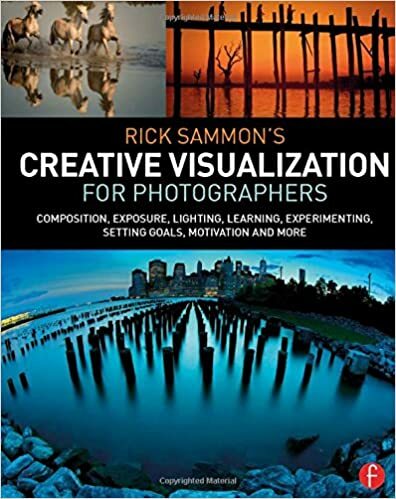 Studying the basic elements of visual design and understanding how they work will help new photographers improve their composition, but simply following rules does not guarantee success. Furthermore, how an audience responds to an image depends on their past experiences (memory), interests, and what it is that they are looking for. This is why the same picture often receives a variety of responses from different viewers. To create effective images a photographer must understand the way people respond to various kinds of visual organization. 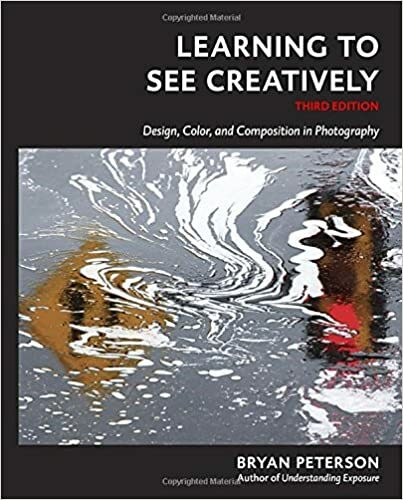 This involves learning the vocabulary of design, viewing examples of artwork that utilize effective design elements, and actively implementing components of design into the process of photography. A line represents a "path" between two points. A line can be straight, curved, vertical, horizontal, diagonal, or zigzag. Lines imply motion and suggest direction or orientation. A line can also be implied, that is filled in by the mind when several points are positioned geometrically within a frame. Placing four dots on a page in the shape of a square can imply the points are linked as the mind searches for recognizable patterns. The direction and orientation of a line can also imply certain feelings. Horizontal lines imply tranquility and rest, whereas vertical lines imply power and strength. Oblique lines imply movement, action and change. Curved lines or S shaped lines imply quiet, calm and sensual feelings. Lines that converge imply depth, scale and distance - a fence or roadway converges into the distance provides the illusion that a flat two-dimensional image has three-dimensional depth. A line is an effective element of design because it can lead the viewer's eye. To create more effective photographs actively look for lines and arrange them within your viewfinder to invoke specific feelings. Shapes are the result of closed lines. However shapes can be visible without lines when an artist establishes a color area or an arrangement of objects within the camera's viewfinder. Some primary shapes include circles, squares, triangles and hexagons all of which appear in nature in some form or another. Space is defined and determined by shapes and forms. Positive space is where shapes and forms exist; negative space is the empty space around shapes and forms. For images to have a sense of balance positive and negative space can be used to counter balance each other. Form refers to the three-dimensional quality of an object, which is due in part to light, and dark areas. When light from a single direction (e.g. our sun) hits an object, part of the object is in shadow. Light and dark areas within an image provide contrast that can suggest volume. Factors that can affect our feelings towards an image include the direction of the light source, from above or below, and the gentleness or abruptness of the half tones. Light coming from behind a subject can form a silhouette resulting in object that is completely black against a lighter colored background. Silhouettes appear as two-dimensional shapes lacking form. The absence of color often enhances our perception of form for instance in black and white photographs. Light emitted from above and to the side when applied to portraits creates what is often referred to as "Rembrandt lighting". This form of lighting emphasizes edges and depth. 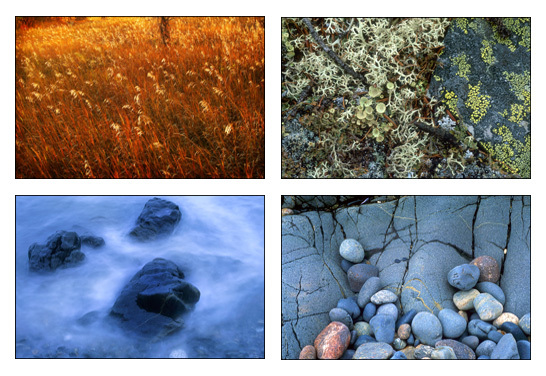 In landscape photography oblique lighting occurs early and late in the day where it enhances the natural texture of the landscape and is often accompanied by warm or cool color casts. There has been a tremendous amount of research on how color affects human beings and some of this research suggests that men and women may respond to colors differently. Color affects us emotionally, with different colors evoking different emotions. In short color has the capacity to affect the human nervous system. Hue: refers to the names of the primary colors, red, green and blue. Value: lightness and darkness of the color - the amount of white or black added. Analogous colors next to each other on the color wheel "get along" and are referred to as being harmonious. Analogous colors are often used in visual design and have a soothing affect. Complementary colors: colors opposite to each other on the color wheel, e.g. Blue-violet and yellow, represent colors positioned across from each other on the color wheel. Complimentary colors exhibit more contrast when positioned adjacent to each other -for example yellow appears more intense when positioned on or beside blue or violet (see picture below). 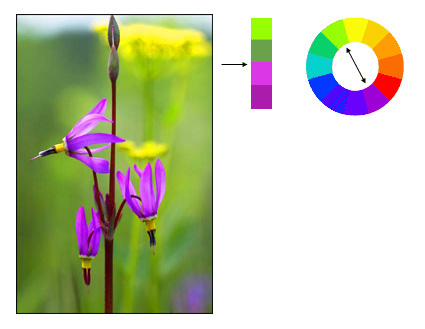 In the photograph above - green and yellow are analogous colors that harmonize where as the violet color of the shooting stars appears more intense against a complementary colored background. Warm colors include: yellows, red and orange we associate these with blood, sun and fire. Sunrise behind a popular tree at Writing-on-Stone has a warm fire like feel to it. 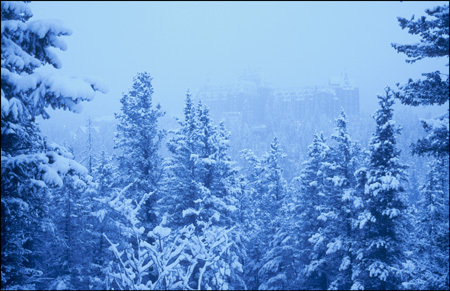 Cool colors include: violet, blue and green because of our association with snow and ice. Colors are called warm or cool because of our association with various elements in our surroundings. Red, yellow and orange are considered warm colors whereas blue, green and violet are considered cool colors. These contrasts are relative since yellow-green are cool next to red, orange or yellow, but would be considered warm next to blue-violet. Photographers can position different colors in an image to maximize contrast between them and also to provide perspective. Perceptually, cool colors tend to recede into the distance whereas warm colors appear to advance (see image below). 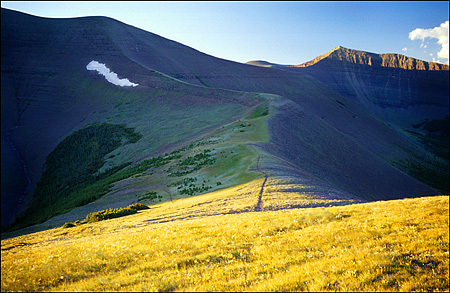 Loaf Mountain - warm glow of sunrise advances where the cool blue shadows recede. Texture refers to the surface quality or "feel" of an object - smooth, rough, soft, etc. Textures may be actual (felt with touch - tactile) or implied (suggested by the way an artist has created the work of art -visual). Texture is often emphasized in oblique lighting as it strikes the objects from one side. Organizing the various elements within the frame of the viewfinder in order to create an effective design is more challenging than it might seem at first. 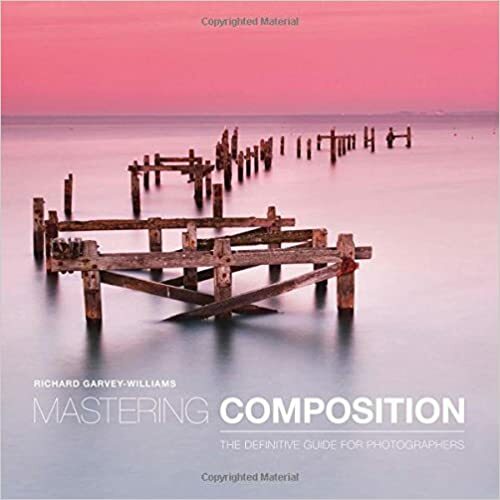 A painter can position the elements where they want, whereas a photographer must search, find and organize visual elements within the camera viewfinder. Although a photographer can sometimes "arrange" objects in a natural environment such as leaves, this often results in a contrived looking picture. Nature is not perfect and variation within organization leads to greater interest. Effective composition of natural images is always a balance between arranging elements within the view finder and allowing a certain amount of disorder. The decision-making processes we make when taking a photograph starts first with being able to see possibilities. What we see depends on what we are interested in, what we are looking for and what our minds are prepared to show us. Seeing, in short, involves the mind and our memory as much as it does our eyes. Improving our visual sensitivity requires quieting our minds, relaxing, and preparing by learning as much as we can about our preferred subjects. Once we see things that are of interest, then we need to isolate parts of the scene, and organize the important visual elements within our viewfinder to effectively convey how we feel about them. Unity refers to an ordering of all elements in an image so that each contributes to a unified aesthetic effect so that the image is seen as a whole. Failing to accomplish this results in the premature termination of the viewer's experience - they look away. There are a number of ways to achieve unity to attract and keep the viewers attention. An artist or photographer attempts to control the sequence in which visual events in the frame are observed and the amount of attention each element receives. Making an element dominant can be done through size and color. Large objects dominate smaller ones and warm colored objects dominate cooler pale colored objects. Another way of achieving dominance is through positioning various elements within the frame. A centrally located object will draw more attention then one at the periphery. However the center is not the best place to position the most dominant element - usually just to one side of the center is more effective. Another method to achieve dominance is through convergence or radiation or lines. The eye tends to follow these lines to the point where they converge. 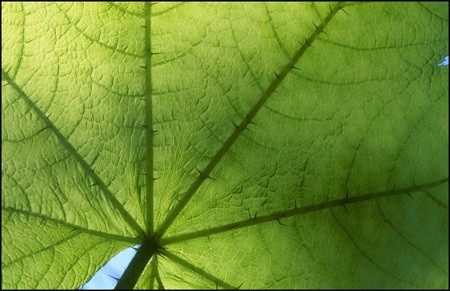 Veins on this leaf converge at a single point making it the dominant element in the image. Dominance can also be achieved through nonconformity i.e. difference or exception. If all the elements are similar and one is different in color, tone or shape- it will stand out and become dominant. 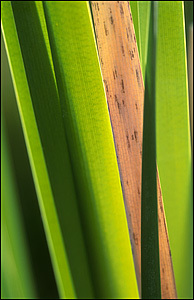 The brown cattail leaf below is dominant because it is different from those around it. Coherence refers to the belonging together or the various parts of the artwork. In reality these parts may be unrelated, but within the confines of the image their color, shapes, and size form a sense of unity. Visual coherence can be achieved through the use of analogous color and color tonality. It can also be achieve through similarity of shape, color size or texture. However too much similarity can lead to boredom - we need some variety to add "spice" to the image. 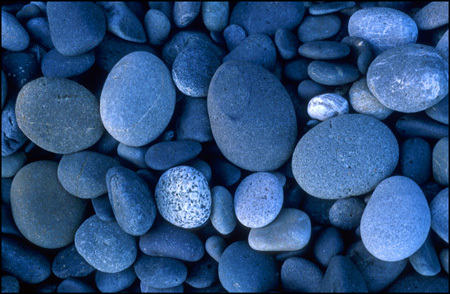 This image of smooth stones uses similarity in shape, size and colors to provide coherence. Balance implies that the visual elements within the frame have a sense of weight. Large objects generally weigh more than small objects and dark objects weigh more than light colored objects. The position of the elements is also critical. 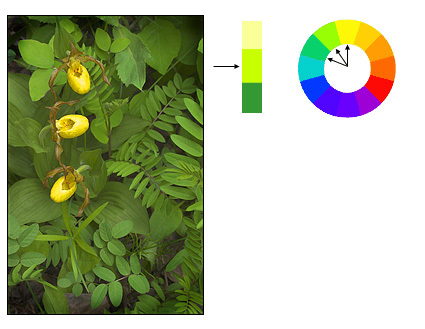 We unconsciously assume the center of a picture corresponds to a fulcrum. A heavy weight on one side can be balanced by a lighter weight on the other side if the lighter weight is located at a greater distance from the fulcrum. Another way to achieve balance is through symmetry. 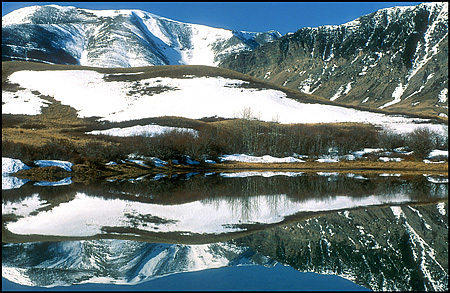 Reflections of the landscape in still water are an example of almost perfect symmetry. Reflections can take on an abstract quality that resembles a Rorschach inkblot used in a psychological testing. Rorschach inkblot created by folding a piece of paper coveredand filled with ink to form a symmetrical pattern. Positive space is where shapes and forms exist; negative space is the empty space around shapes and forms. 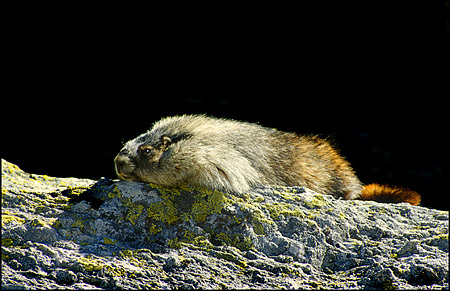 In the photo below the black area is negative space and it serves to balance the area in which the marmot and rock occupy. Areas of a picture that contain "nothing" are important visual elements that provide balance in an image. Rhythm refers to the regular repeating occurrence of elements in the scene just as in music it refers to the regular occurrence of certain musical notes over time. In photography the repetition of similar shapes sets up a rhythm that makes seeing easier and more enjoyable. Rhythm is soothing and our eyes beg to follow rhythmic patterns. To be effective, rhythm also requires some variability - rhythm that is too similar or perfect may be boring. Therefore when composing your images look for repetition with variation. For instance if you are photographing a fence - one that is perfect will not hold a viewers interest for long, but one in which some of the posts are bent, broken, larger or smaller will generate more viewer interest. 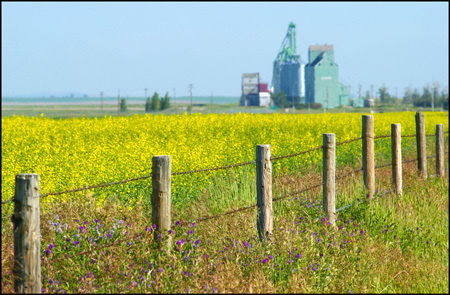 Differences in the height of the fence posts add interest to an otherwise monotonic rhythm. The yellow marigold is balanced by the negative space of the complimentary colored blue sky. Proportion refers the size relationship of visual elements to each other and to the whole picture. One of the reasons proportion is often considered important in composition is that viewers respond to it emotionally. Proportion in art has been examined for hundreds of years, long before photography was invented. One proportion that is often cited as occurring frequently in design is the Golden mean or Golden ratio. 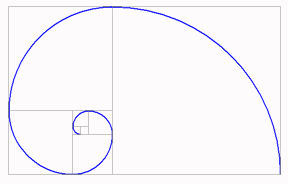 Golden Ratio: 1, 1, 2, 3, 5, 8, 13, 21, 34 etc. Each succeeding number after 1 is equal to the sum of the two preceding numbers. The Ratio formed 1:1.618 is called the golden mean - the ratio of bc to ab is the same as ab to ac. If you divide each smaller window again with the same ratio and joing their corners you end up with a logarithmic spiral. This spiral is a motif found frequently throughout nature in shells, horns and flowers (and my Science & Art logo). 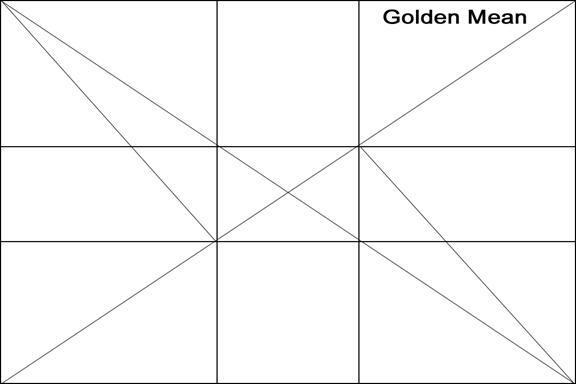 The Golden Mean or Phi occurs frequently in nature and it may be that humans are genetically programmed to recognize the ratio as being pleasing. Studies of top fashion models revealed that their faces have an abundance of the 1.618 ratio. Many photographers and artists are aware of the rule of thirds, where a picture is divided into three sections vertically and horizontally and lines and points of intersection represent places to position important visual elements. The golden ratio and its application are similar although the golden ratio is not as well known and its' points of intersection are closer together. 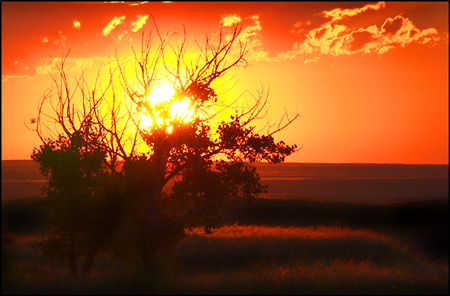 Moving a horizon in a landscape to the position of one third is often more effective than placing it in the middle, but it could also be placed near the bottom one quarter or sixth. 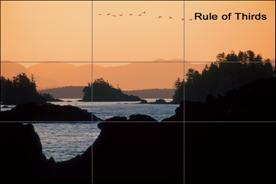 There is nothing obligatory about applying the rule of thirds. In placing visual elements for effective composition, one must assess many factors including color, dominance, size and balance together with proportion. Often a certain amount of imbalance or tension can make an image more effective. This is where we come to the artists' intuition and feelings about their subject. Each of us is unique and we should strive to preserve those feelings and impressions about our chosen subject that are different. 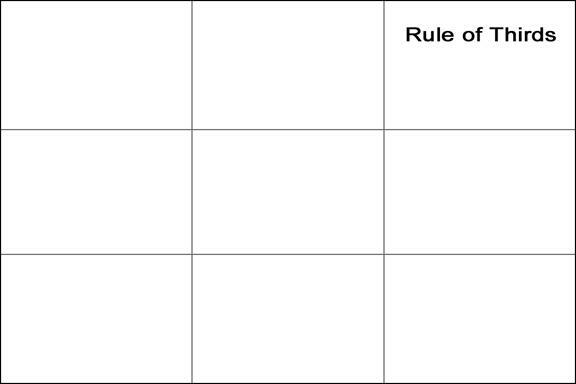 On analyzing some of my favorite photographs by laying down grids (thirds or golden ratio in Adobe Photoshop) I find that some of my images do indeed seem to correspond to the rule of thirds and to a lesser extent the golden ratio, however many do not. I suspect an analysis of other photographers' images would have similar results. 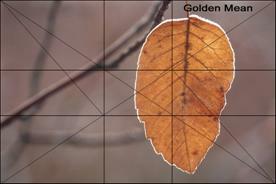 There are a few web sites and references to scientific studies that have studied proportion in art and photography but I have not come across any systematic studies that quantified their results- maybe I just need to look harder (see link for more information about the use of the golden ratio http://photoinf.com/Golden_Mean/). In summary, proportion is an element of design you should always be aware of but you must also realize that other design factors along with your own unique sensitivity about the subject dictates where you should place items in the viewfinder. Understanding proportion and various elements of design are guidelines only and you should always follow your instincts combined with your knowledge. Never be afraid to experiment and try something drastically different, and learn from both your successes and failures. Also try to be open minded about new ways of taking pictures, new techniques, ideas - surround yourself with others that share an open mind and enthusiasm and you will improve your compositional skills quickly. 35 mm film has the dimensions 36 mm by 24 mm (3:2 ratio) - golden mean ration of 1.6 to 1 Points of intersection are recommended as places to position important elements in your picture. Chaos - Simplicity versus complexity. Chaos is a disordered state of elements and it is found frequently in nature. 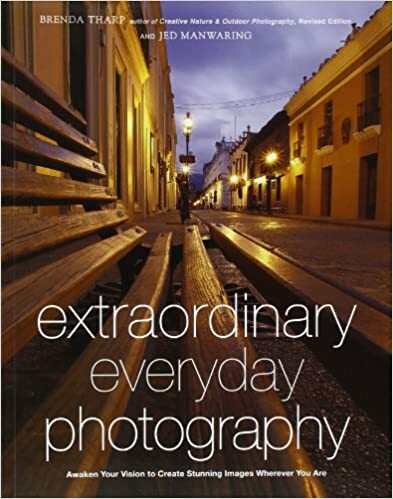 The goal of many photographers is to take a picture that exhibits some underlying organization so the viewer sees what the artists intends for them to see, but leaves enough chaos within the frame of the image so the viewer has to put forth some effort to explore and fully appreciate the image. New photographers often include too many elements in their images and can often improve their composition by removing unessential elements. Beyond a certain point, however an image that is too simple fails to hold ones attention (e.g. single leaf above has interesting elements but after a few moments I find little to hold my attention). 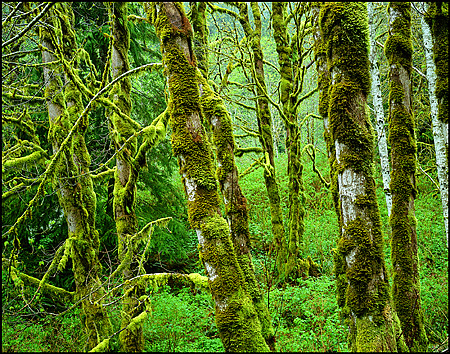 Compare this to an image I took with my 4 x 5 camera of the rainforest shot below, and I find the rainforest image has so many textures and patterns that I can look at and explore the image for extended periods of time and still continue to discover things I have not seen before. The ability to introduce and handle complex elements within the frame of an image and still produce an effective composition requires a maturation of seeing that takes time to develop. I have also found that larger film formats encourage compositions with more detail and complexity then using smaller digital and 35 mm film based cameras. In short, the size and format of camera you use will also influence what you shoot, and how you compose your images. Understanding elements of visual design and how they can affect our emotions can also help us make our photographic images more effective. However, keep in mind that no rule or guideline can ever guarantee success. A successful image depends upon a multitude of things that must come together including: timing, lighting, color, composition, and an audience sensitive to what it is you are trying to communicate. It is likely that many artists carry out design intuitively and arrange elements so they "feel right" and since art is in part a way of expressing our feelings to others no other guiding principle may be required. As Freeman Patterson put it so eloquently "Good composition is always harmonious with the design of the material being photographed", Art of Seeing 1985. Elements of design can be compared to the scales in music, they are starting points around which music is made but the elements are by themselves only building blocks. In conclusion, an understanding of the elements of design will not by themselves make you a better a photographer, but they can provide a framework in which to evaluate images and their effectiveness. 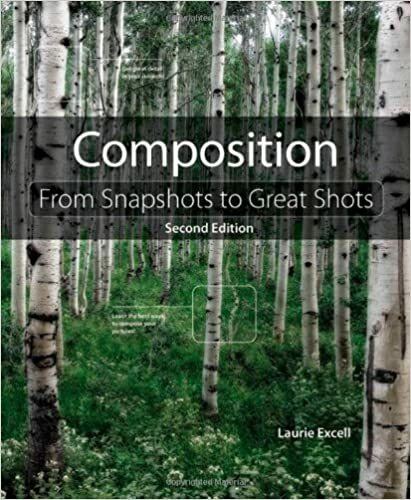 Another way to improve composition is to compare your images with those of others whose work you admire or respect. Mimicry is one way to begin to develop your skills and learning to copy the styles of certain artists is in part the road to towards developing your own style, although many artists may not admit to it. Take those stylistic elements you like and then integrate them into your own point of view. Evaluate and compare your work both technically and aesthetically against those of other photographers. Be realistic and critical when you evaluate your own images and edit your images ruthlessly. The better you become the more critical you will become of you own work and those of others. Listen to what others have to say when they view your images, what they like, what they don't like but always be true to yourself and what your vision is. My wife may not be knowledgeable about design, but if she responds to image I know others will too. One method to measure your success is when others wish to own or purchase your work. If you don't have to sell your photography to pay the rent or eat - you have a freedom that many professional photographers do not. You can take photographs for the sheer joy of it. F. Patterson (1994) Photographing the World Around You, Quebecor Printing Inc., ISBN-1-55013-590-2. F. Patterson (1977) Photography for the Joy of it. Van Nostrand Co. New York, ISBN 0-442-29883-8.